Central Park was occupied all day Tuesday with everything from mascots to collegiate tennis players (Bill Kallenberg/BB&T Atlanta Open). Herschel Walker, Heisman trophy winner and football Hall of Famer, walked with Nathan Pasha and the Patriot Brass band from Kennesaw State in a processional through the Atlantic Station. Crowds formed throughout the multi-use facility as the Georgia fight song echoes around the buildings. The occasion: The tournament’s first College Night. Walker joined Nathan Pasha, a University of Georgia Bulldog who received a main draw wild card and was playing his first ATP World Tour main draw match. He entered the tournament four days ago after his teammate, Austin Smith, withdrew because of a tournament conflict. He used the time walking with Walker to gather some advice from a fellow Dawg. Walker performed the coin toss for the night match between Pasha and Lukas Lacko. Walker also made an appearance at the USTA Family Zone, swatting a few low-compression tennis balls, signing autographs and flashing a big smile for photos with admirers. 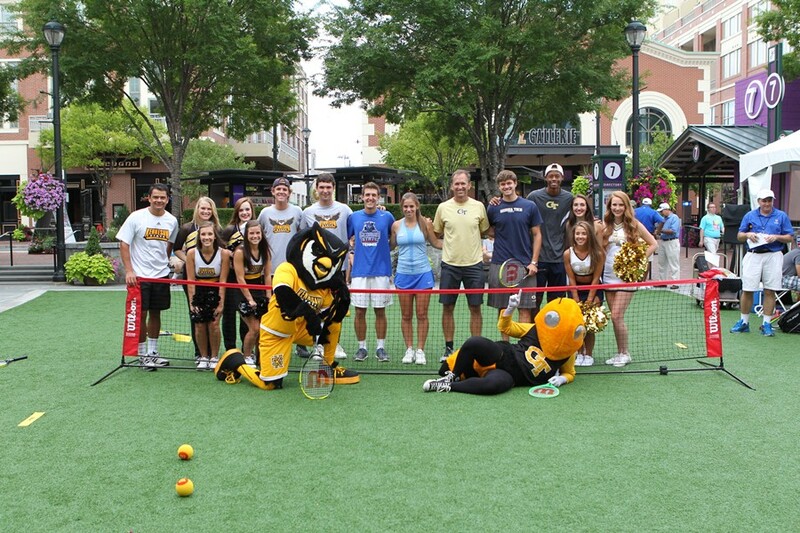 Players from Georgia State, Georgia Tech, and Kennesaw State played a unique brand of tennis games in the zone during the afternoon with a crowd of tennis fans, onlookers and young players. With USTA Georgia Executive Director Darren Potkey handling the mic, the colleges faced off on the USTA Youth Tennis 36’ courts. Teams had to hit alternate balls in one game and hold hands in another. Nathan Rakitt, Georgia Tech player who also competed in the qualifying rounds of the tournament, participated in the afternoon’s events. Even some local players who grew up around Atlanta tennis, like University of North Carolina player Caroline Price, attended the activities. She enjoyed watching college players compete in a professional setting. College players received a BOGO for the Tuesday’s matches. They were encouraged to wear their team colors and bring a friend to cheer on this evening’s players.